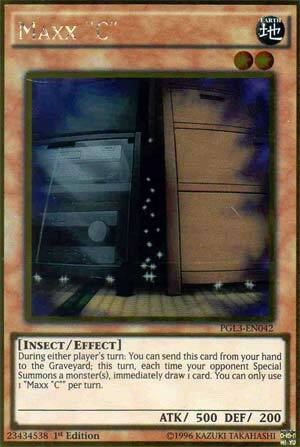 During either player’s turn: You can send this card from your hand to the Graveyard; this turn, each time your opponent Special Summons a monster(s), immediately draw 1 card. You can only use 1 “Maxx “C”” per turn. Throwback Thursday is going to be a quick one, because Maxx “C” is really easy to understand. Pitch when a Special Summon of your opponents happens, draw off of each Special Summon. This card was so good when it was legal, and insanely good when limited to 1. If you drew Maxx “C” first, you had a distinct advantage. Making it 3 would have solved this disadvantage to the other player, while still encouraging conservative play rather than seeing who can make the bigger board. If you pitched Maxx “C” you were likely stopping a big turn from happening. If your opponent continued, they risked giving you what you needed, or filling your hand with resources in addition to your already-good hand. Best of the “C” archetype by light years. Could come back, but has to be 3 I think. We take a quick trip to Banned Camp to say hi to the best of the ”C” cards, Maxx ”C”. Maxx ”C” is a Level 2 EARTH Insect with 500 ATK and 200 DEF. Most to all Level 2s have abysmal stats. EARTH once again is nice, but Insect doesn’t have much. Being Level 2, though, I think this makes this card searchable with Krawlers when legal. While in the hand during either player’s turn, you can discard this card to draw a card every time the opponent Special Summons a monster. This was a beloved hand-trap for a reason. This card is a great way to punish overextending without having good protection. Maxx ‘‘C” is easily the best hand-trap printed and Ash Blossom doesn’t even come too close in my opinion, and I thought that card was a 5/5. This is a card honestly that should be either banned or at three in my opinion. Putting it at one or two makes it more sacky, so having it banned or at three makes the playing field more even. I do think this being at three is fine, it is sort of a necessary evil, but I’m just happy they made up their mind on either banning it or having it unlimited. Art: 3.5/5 I really wonder what that little Insect looks like to be honest. Maxx “C” is our throwback this week. I don’t exactly like to make a habit of reviewing Banned cards, even for Throwback Thursday, but this card has only been reviewed I believe when it came out. So it seemed worthy of another look. This card is Banned, and with good reason. You ditch it during either player’s turn, and plus the hell out of it. Either you dump it for you, and Special Summon like crazy…you only need two Draws to make this a +1. If your opponent is playing and it was dumped on their turn, they need to hope to either finish you that turn, or hope whatever your were able to Draw won’t finish them. Unless they’re too scared all together, and refuse to Special Summon to keep you from Drawing. Consistency is key for this week. At least we are on a positive uptrend. Maxx “C” is of course Banned/5 and 5/5. Art is creepy and awesome with a 4.5/5.